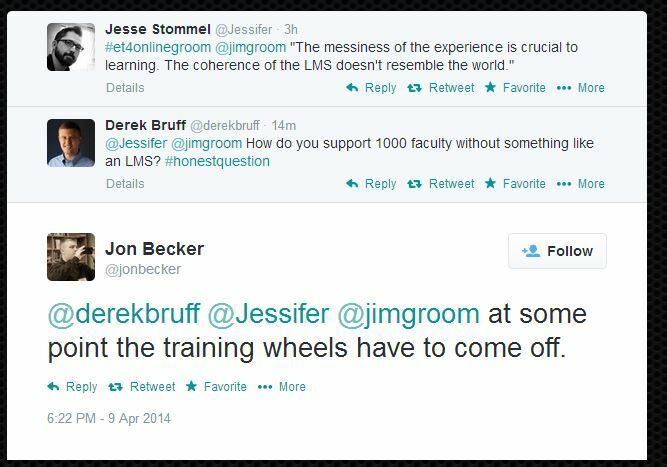 The LMS qua training wheels – Jonathan D. Becker, J.D., Ph.D. Taking your analogy one step further, I would agree with you that the LMS functions as training wheels. The problem is, that like training wheels, the LMS teaches the wrong skills. Sure it helps us peddle and move forward, but we haven’t learned the most important thing first, balance. Now a balance bike (no peddles and two wheels) allows kids to learn balance first. The peddling is the easy part, especially once you’ve learned to balance. In this analogy I see platforms like WordPress to be the balance bike. It forces you to learn by feeling it out. Coming up with your own way of building an environment for learning. As Jim says, “The messiness of the experience is crucial to learning.” The LMS just teaches bad habits like PowerPoint.